Help us bring these badass biking superheroes to life on the big screen! 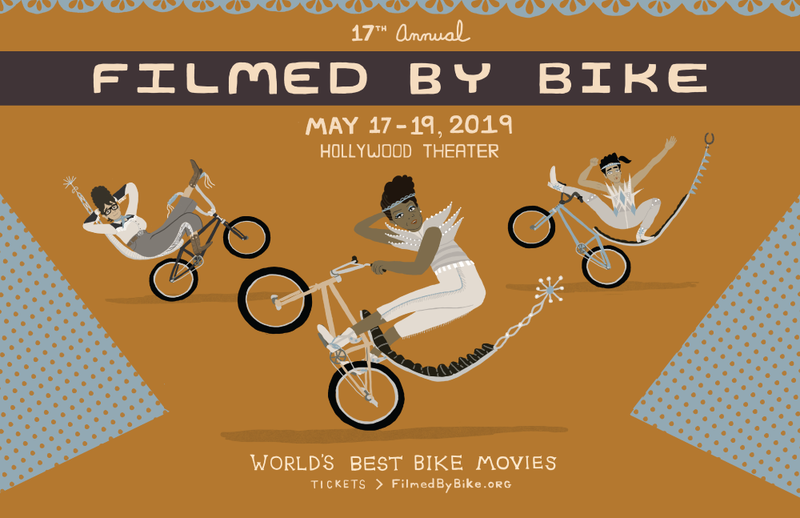 Filmed by Bike is a film festival that features the world’s best bike movies. Every year we host an expansive film festival at the Hollywood Theatre in Portland, Oregon. After Portland wraps up, our festival travels year round, worldwide. This is our 17th year. The Festival Trailer is a creative festival-produced piece that sets the tone for the year’s festival, and offers us the opportunity to have some lighthearted fun with a marketing piece. We invite a guest filmmaker to produce the trailer. This year’s trailer is a series of 3 30-second vignettes featuring badass superhero women on bikes in absurdist scenarios. Produced by local filmmaker and Filmed by Bike Board Member Mike Vogel. The 2019 Festival Trailer will be shown at the Ticket Release and Festival Launch Party March 1 in Portland. The trailer also shows on screen for our three-day festival May 17-19 at the Hollywood Theatre in Portland, and in 30+ cities worldwide throughout the year. We are seeking leads and extras. These are unpaid roles. Shooting will take place various times from February 7-17. Must be able to ride a small kid-style or BMX-style bike comfortably up hill for a very short distance and look like you really know what you’re doing. She’s a badass on a bike, but she’s so chill. She passes a group of performance riders who are talking about how their gear, bike weight, components and attire give them the extra edge to ride faster. She doesn’t have anything like that on her bike, and she’s in her superhero costume. But still, she smokes them on the climb. Must be able to ride a BMX bike and jump a ramp with style. Costume provided, you’ll probably want your own bike for this. She’s a mom who can bake a casserole just as well as the rest of them, but she only does that because casseroles are easy dinner. She makes small talk with the neighbors because why not. But really, in between juggling kid activities she prefers to CBD chill and super relax. She super strong and doesn’t take crap from anyone. Oh, and she can totally jump a BMX ramp like it’s NBD. Seeking 2-3 kids age 8-14 to fill this role. Girls and people of color are strongly encouraged to apply. A few lines. No bike riding required but optional. No trick riding or ramp jumping. Seeking people of color of all ages for a seated non-speaking role. Shooting happens Wednesday, February 6 from 5:30-7:30pm in NE Portland. Must be able to attend the entire session.